Good morning. Ina remains felled by the flu, so I'll once again be your Login host. This is how online myths start. And they are that much harder to counter because there's no original of O'Rourke's posted video we can consult: Stories on Instagram and Snapchat typically disappear after 24 hours. 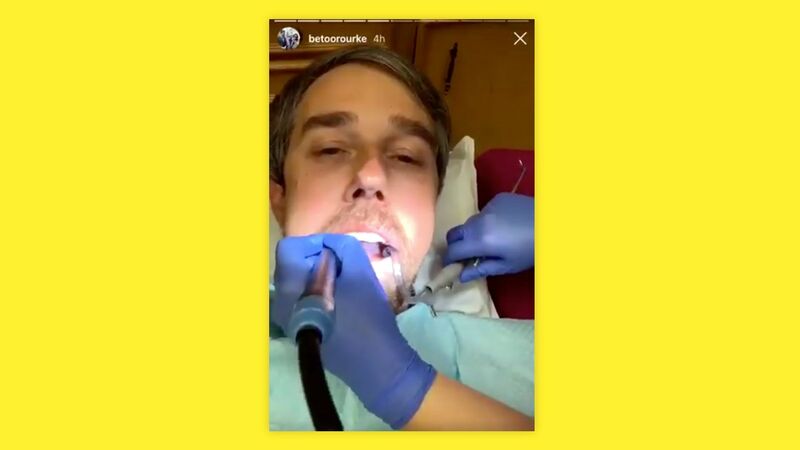 What actually happened: O'Rourke interviewed his dental hygienist as part of a series of posts about life on the Texas border. The video as O'Rourke posted it can still be found online, but some other versions now on the internet have been altered or manipulated in misleading ways. O'Rourke was following the lead of Rep. Alexandria Ocasio-Cortez, whose Instagram Stories — from congressional orientation to her kitchen — also seem to have inspired presidential candidate Sen. Elizabeth Warren t0 crack a beer and go live. The big picture: As Instagram and Snapchat Stories become a dominant mode of online expression and political outreach, their ephemerality becomes a problem — both for fact-checking and for history. We don't have an Internet Archive for Instagram Stories like O'Rourke's. What we do have is political opposition researchers, who have long sent young staffers to record candidates in person. Sarah Dolan, the executive director of America Rising, a conservative group that tracks Democratic candidates, says it is already recording and archiving Instagram Stories from anticipated top-tier 2020 candidates. Yes, but: For political operatives, this isn't that new a world. "It’s generally also ephemeral when people talk to a town hall, or at least it was until everyone had a smartphone, so I don’t see it as particularly different," says liberal group American Bridge's research director Pat Dennis. This happened even before the internet era: George H.W. Bush's "Wow, these supermarket scanners are incredible" moment didn't really happen that way, but it hurt him with voters anyway. The bottom line: New technologies and media formats keep making it easier for people to get things wrong. Facebook says it's granting a total of $300 million to news programs, partnerships and content over the next 3 years, a similar amount to a commitment from the Google News Initiative last year, Axios' Sara Fischer reports. Why? Facebook says it's investing heavily in local news, in particular, because having spent more time with local news publishers via its accelerator programs over the past year, the company believes it will have the biggest impact in those areas. Yes, but: While the news industry welcomes these contributions, it will be difficult to reverse the tense relationships tech companies, and in particular, Facebook have had with some local and national publishers. " Go deeper: Read Sara's full story on Facebook and her bigger dive into Big Tech's investment into local news. Ina sent this one in from her sickbed ... As Intel's quest for a new CEO passes six months, one name that has been on the company's list but hasn't been previously reported is Apple's Johny Srouji. As SVP of hardware technologies, Srouji has overseen the company's push into, among other things, designing more of its own silicon. While not an insider, Srouji does have quite a bit of experience with the chipmaker, having worked at its Israel facility from 1990 to 2005. Meanwhile, Bloomberg reported Monday that several executives that had been under consideration are now out of the running. These include former Motorola chief Sanjay Jha, and two former Intel executives Anand Chandrasekher and Renee James. Flashback: In case it's been so long that you've forgotten, Intel has been looking for a CEO since cutting ties with Brian Krzanich for a consensual relationship with an Intel employee. CFO Bob Swan has been interim CEO and is not currently a candidate for the gig full-time. Read more about Srouji in this 2016 Bloomberg feature. After months of search, autonomous driving company Zoox has a new CEO: former Intel chief strategy officer Aicha Evans, Axios' Kia Kokalitcheva reports. Last August, the company’s board ousted co-founder Tim Kentley-Klay from the position. The big picture: Zoox’s choice of a seasoned executive with experience from a large tech company over cowboy entrepreneurs shows that these companies know that’s what they need if they want to bring their futuristic tech to market—their next big challenge. “The vision is intact ... Nothing has changed about the company,” Evans tells Axios, adding that the task now is to nail each next step for the company to reach its ultimate goal of getting fully self-driving cars on the road. “My goal is that a year from now no one remembers that I wasn’t here at the beginning,” she says. Born in Senegal and raised in Paris, Evans has been at Intel since 2006, leading various units and becoming its chief strategy officer in 2017. While she says she wouldn’t call herself an “expert” in autonomous driving, she has been involved in the area thanks to Intel’s own foray into the industry, especially via its acquisition of computer vision company Mobileye nearly 2 years ago for $15 billion. Background: In August, Zoox’s board of directors ousted Kentley-Klay one month after it announced a new $500 million funding round, valuing the company at $3.2 billion. Kentley-Klay described the move as a surprise at the time, while sources told Axios that the decision was made because of his abrasive and uncompromising personality. What’s next: “We still believe we’re on track to get our vehicles on public roads by 2020 with paying customers,” Zoox co-founder and president Jesse Levinson tells Axios. Editor's note: The story has been updated to correct the spelling of Zoox president Jesse Levinson's last name. HP and Apple veteran Allison Johnson is joining PayPal in the newly created role of chief marketing officer. Watch UCLA Bruin's gymnast Katelyn Ohashi earn her perfect 10 score over the weekend at the Collegiate Challenge in Anaheim, California.